Though his work was little known outside Italian intellectual circles for most of the twentieth century, anthropologist and historian of religions Ernesto de Martino is now recognized as one of the most original thinkers in the field. This book is testament to de Martino’s innovation and engagement with Hegelian historicism and phenomenology—a work of ethnographic theory way ahead of its time. This new translation of Sud e Magia, his 1959 study of ceremonial magic and witchcraft in southern Italy, shows how De Martino is not interested in the question of whether magic is rational or irrational but rather in why it came to be perceived as a problem of knowledge in the first place. Setting his exploration within his wider, pathbreaking theorization of ritual, as well as in the context of his politically sensitive analysis of the global south’s historical encounters with Western science, he presents the development of magic and ritual in Enlightenment Naples as a paradigmatic example of the complex dynamics between dominant and subaltern cultures. Far ahead of its time, Magic is still relevant as anthropologists continue to wrestle with modernity’s relationship with magical thinking. Perhaps because he was uniquely equipped to bridge the chasm between philological folklore studies and the field orientation of anthropology, Ernesto de Martino was also a pioneer in his recognition of both the theoretical capacities of ordinary people and the historical formation of ideas—notably magic—that are often presented as existing in a timeless past. His encyclopedic knowledge gives substance to a careful exploration of the dynamics that conjoin subaltern with hegemonic cultural forms and practices, leading us, in a remarkable anticipation of current anthropological views, to a reflexive reappraisal of the meanings of “rationality” and “Enlightenment.” Dorothy Louise Zinn’s precise and lucid translation brings a clear focus to the originality as well as the groundedness of de Martino’s observations on the role of social agency and historical contingency in the operation of thought and reason. Written half a century ago, de Martino’s theory of magic has been a well-kept secret. No longer. 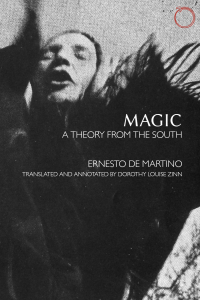 In these pages de Martino lays out his view of magic as a technique for combating precarity—“the negative,” as he refers to it—in the Southern Italian situation of marginality and impoverishment. In an early twenty-first century where the economic circumstances of so many people have “gone south,” de Martino’s existentialist ideas of crisis, risk, and the “loss of presence” have wider applicability than he could have imagined. Albahari, Maurizio. “Magic: A Theory from the South.” American Anthropologist 118, no. 2 (2016): 422-423. It is a thought-provoking work that questions the shifting boundaries between south and north, naive and learned, magic and religion. Originally published in 1959 in Italian and now available in Dorothy Zinn’s precise translation, the book is part of the trilogy that makes de Martino (1908-1965) a seminal figure at the intersection of folklore, ethnology, and the historical and philosophical study of religion…. [Zinn] illuminates de Martino’s academic context and his usage of standard and nonstandard Italian, reflecting the work’s ethnographic focus on the southern region of Basilicata. Macdonald, Fraser. “Magic: A Theory from the South.” Anthropological Forum 27, no. 2 (2017): 173-175. Had he been working in English and not his native Italian, one has to think de Martino’s stature and regard within anthropology would have been considerably greater, and that this work would be counted alongside other famous anthropological examinations of the occult. …there are three key attributes that the book possesses that to my thinking make it stand out as especially significant for contemporary anthropologists that study human relationships with the sacred. The first is that de Martino very strongly underscores the cosmological significance of magical ritual, seeing it not simply as a means to an end but also as signalling broader parameters of the world enshrined in myths… A second point of significance is de Martino’s characterisation of Lucanian magic as not a historical ‘detritus’ or expression of an ancient past (despite his use of the term ‘survival’) but rather as something that is thoroughly conditioned by contemporary circumstances. …A final and broader point is that, as a book focussed on the intersection of magic and Christianity, it forces those of us working in the Anthropology of Christianity to reconsider the received historical narrative that typically attributes the emergence of such studies as having occurred in the 1980s and 1990s. Although de Martino does not explicitly frame his work as an anthropological study of Christianity… his book fully deserves to be seen as a rich ethnographic study of Southern Catholicism and its intermingling with local occult practices. Portelli, Stefano. “Magic: A Theory from the South.” Association for the Study of Modern Italy 22, no. 3 (2017): 347-349. The importance of Ernesto de Martino’s work for Italian ethnography can hardly be over-estimated. Trained as a philosopher, de Martino revolutionised the study of folklore by challenging the compilative and ‘naturalist’ approach of the 1940s and 1950s. …Zinn’s precise translation and annotations infuse new life into a text published more than half a century ago, but which still surprises with its modern flavour. Her translation of the book’s original title as Magic: a theory from the South seems to allude to postcolonial theory: the word ‘Sud’ for de Martino referred only to Southern Italy, in the context of the questione meridionale; here it hints at the multiple ‘Souths’ to which anthropology directs its scrutiny, and to the gap between mainstream and alternative interpretations of social facts. Rivera Andía, Juan Javier. “Magic: A Theory from the South.” Entangled Religions 4 (2017): 40-44.